Have you noticed that when you are idle or have free time, you tend to scribble a picture or draw a pattern? Or when you gaze at the sky or at an empty wall , do you get to see a volley of pictures right before your eyes and your mind seems to connect all the dots? Then don’t be puzzled, you are gifted with the sense of art within you. Some people do have that flair but not sure how to proceed in their life as a career. Wondering if there are such opportunities in the world where you could best your talents to your desire and still earn. Then, here are some of the jobs that require drawing skills as its core needs. A multimedia artist and animator uses their creativity to design 2D or 3D images with the help of modelling programs or computer animation that is used for commercials, special effects for movies, music videos, games videos. The artist needs to be familiar with effect of colour, texture, shades, light, and shadow to produce life-like images. They would be also involved in editing for story development. There are opportunities in areas where there is need for creation of labels, development of multimedia presentations or marketing or technical presentations or even web pages. The job requires the person on knowing how to gather requirements from clients, create designs, collaborate with other members like writers, artists, sound engineers, programmers. Skill sets required are having good communication, good hand drawing techniques, planning, scripting, know the use of some softwares like Adobe Illustrator, Photoshop, Dreamweaver, Flash and Flash Animator, InDesign, able to scan and produce digital camera ready art, able to manage time, willing to share, understanding and listening carefully. A degree in fine arts, graphic designs, visual art, 3D designing, digital photography, computer science, multimedia animation, software development is also helpful. Architects are known to be involved in designing new buildings and complexes, alter existing buildings, advice for restoring or conserving old property. Their work are mostly related with construction, professionals like engineers, surveyors bringing out designs as per the specifications of the project. They could work as freelance or part timer but can go up to management level in multinational organizations producing iconic structures. As their role is mostly related with construction, their main functions would be discussing the objectives, consulting with other professionals, advising of the sustainable factors, producing detailed drawings in alignment with specification and budget, negotiating with contractors, preparing tenders , controlling project from beginning till end, resolving problems if required to and also ensure that projects does not impact environment. The other qualities required for the job may relate to good communication skills, good analytical skills, organizational and negotiation skills, leadership and team working skills, mathematical skills, project management skills and computer aided design skills. The prerequisites for this profile is a degree in architecture with masters, if needed a internship at some firm. Getting a license would be helpful in setting up your own business. A drafter prepares technical drawings based on the instructions given by architect or engineer. The drawings are visual guidelines on how to construct the product or the structure. Their role is to sketch rough drawings based on computations, calculations given by surveyors, engineers, architects which would finalize with technical details like dimensions, procedures, materials by referring to handbooks, tables, code books, etc. There are other specializations under this category like architectural, aeronautical, civil, mechanical, electrical, electronics, pipeline, and photovoltaic. Architectural drafters deal with building codes, site report, stress calculation, landscaping, etc. While mechanical deals with mechanical parts and systems, incorporating mathematical formula to create the specifications, the civil deals with topographical surveys, geophysical reports to calculate the requirements for excavations and earth moving operations. Each specific specialization requires a degree in their field with expertise in using the CAD software and other software that is in trend. A graphic designer gets to work on websites, advertising books, posters, magazines, product packaging, exhibitions, displays for corporate communications. They need to create graphic elements for print or online matters. There is an opportunity to create art or style on paper directly or on computers using software or styluses. You would work to develop creative ideas and concepts that should stick to the client’s objectives. Of course the job would demand a flair for creativity, being up-to-date with software knowledge, passion for design, being able to communicate effectively, good in presentation, have good time management skills, pay attention to details, having open mind to make changes, effective in networking and being able to work with team. The job profile would require one to liaise with clients, bring out their concepts in terms of designs using illustrative sketches or drawing out layouts before working on computer aided softwares, proof reading to give high quality work, work with other team members who could be the printers, photographers, stylists, copywriters, definers, web developers, marketing specialists. If you prefer to work on your flexi timing, you could select options of self-employment or as freelancer. For this you need to have degree in fine arts, visual art, photography, 3D design or graphic design. To convey ideas in films, video games, comic books, story books, and animated movies requires a special skill. To bring out the characteristic expressions literally and figuratively do require those skills. Why we say freelance is that you would have independence, freedom and convenience of working at your own space and time. The paintbrush and pencils have been replaced with graphics and graphic tablets. As the title itself says, the artist would require to create accurate, visually appealing, stylish, interesting details which captures the feel of the location. They need to work closely with other team members including the art director and artists to bring out the characters. Games designers are involved in designing, creating, programming and producing games for computers, gaming consoles, online games, arcade games, mobile phones, and tablets. As designing of games involves various stages like creating, designing games looks, animation of characters, creating audio, testing and producing, more number of professionals are required. As this is vast field, there are other specializations like programmer – artificial intelligence, network, tool chain, audio engineer, artists, quality assurance tester, editor, designer. Their main responsibilities are developing concepts for games, creating visual aspects, using 2D or 3D modelling, programming games, quality testing, solving technical issues, understand ideas, planning resources and managing team. For this a degree is enough but having knowledge in the fundamentals of physics, mathematics, animation, software engineering, multimedia design, graphic design, computer science, computer games design or development. This industry is a fast moving multi million dollar sector. A jewellery designer creates and make beautiful, unique designs and patterns of jewellery using metals like gold, silver, platinum and precious stones. They use their skills to make or design pieces that have sentimental or symbolic significance that can be worn or considered as decorative artefacts. Jewellery designer can work as freelancer or work in specialist companies where each stage is designed for mass production. Having skill to design, being creative to bring new ideas, ability to work with tools, ability to work with metals, stones, able to use computer software to produce designs, having good communication skills, being patient, having time management skills, show commitment, ability to persuade and negotiate, able to network, showing commitment to work are some of the basic requirements for this profile. You need to have a degree in fashion design, textile design, fine or applied arts, jewellery designing or knowledge in 3D designing. But it does not restrict one from getting training in fields such as silver smithing, gold smithing, metal works, setting, engraving, enamelling, gemstone cutting and carving. As the title clearly explains, a costume designer designs costumes for the characters in theatre productions, television shows, stage performance, movies providing a visual understanding of the period, occupation, social status and age. This job profile is almost linked with fashion designing as they need to have the right combination of colour and texture of the fabric to suit what costume they are going to design. Hence, depending on the script and what period the characters are based on, the costume designer has to do some research on the clothing styles worn in that period. If the period is future, then he / she could use their imagination and create a unique style. They work in co-ordination with the art director, the director, choreographer, and the actor to create their unique patterns using hand sketches which is then converted to costumes after approvals. The accessories like shoes, belts, hats, masks, bracelets, necklaces, bags, jewellery are also selected as per the needs. When it comes to theatre production, the designer needs to know which scene precedes the other and which characters are involved so that they design costumes for making quick changeovers. This profile requires one to be experienced in sewing and designing patterns to explain to the tailors, budget conscious, good communication skill, looking through details, able to work in team. Though a degree in fashion designing is a prerequisite, it does not have limitation to those who have flair for drawing patterns and designs. Creating innovative designs of items of furniture and products that are related with it goes into the profile of furniture designers. They can work alone or with others to create new concepts and designs that has a combination of aesthetical appeal and functional requirement. Designing furniture requires creativity, awareness of the business, marketing, finance, sales and manufacturing. The profile requires one to be creative, having drawing skills, good communication skills, self-motivated, flexible and adaptable, updating with market trends, knowledge of industrial process, understanding software used and having marketing skills. The responsibilities include studying, researching various styles of furniture designs, discussing with clients on the suitability, creating sample designs using software, selecting suitable materials, co-ordinating with craftsperson, finding ways to improve, handling issues of pricing, safety, organising schedules, attending workshops that relate with this sector. If self-employed you may need to carry out functions of designer, production head, accountant, salesperson, maintenance in charge. Although a specified degree is not required, having knowledge in product and furniture design, 3D designing, ceramics and glass technology, art design could be advantageous. Teaching the basic principles of art and art history in school and/or college is main function. You would be aware that there is a separate period in the school curriculum for drawing or arts where the students can use free hand sketching and work with colours. The field of work involves using pencil, paints, pastels, charcoal and also photography. They utilise their skills and provide instructions through various medium, supervise, assist, encourage, teach and grade the work of students. The profile requires one to be proficient in the various forms of art, have creativity and able to teach skills to others. As the field requires teaching skill, the person is required to have a degree in fine arts if willing to work in schools along with license for public schools and postgraduate degree if willing to work in universities or colleges. Besides that training in child psychology, teaching techniques, classroom management, knowledge in art history, ability to communicate effectively on abstract and concrete aspects, ability to spot creativity are also required. It is because they do not love the job, they are in. This is not the case of few but many of them suffer this situation as they fail to pursue their passion as career. If you have a passion and are able to make it your career, then you will excel in your professional life and achieve success. You yourself will be working hard and focus on things which make your work exemplary. 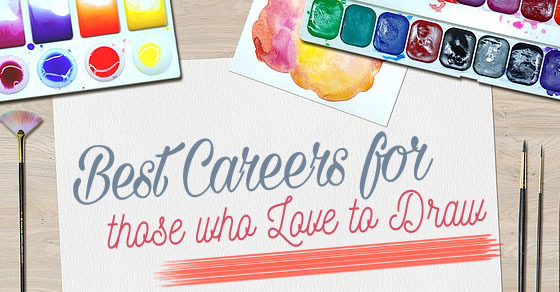 Now if you are someone who loves to draw and paint, then here are few Jobs for artists and people who love drawing. We have also mentioned their average salaries as per the report of Bureau of Labor Statistics and Pay-scale. People earlier did not consider drawing or painting as a career, coz making a living through it seemed impossible to them. Also such kind of activities was considered as a hobby and moreover was not entertained much by others. That was the situation few years back, but now as the market has become diverse, different types of jobs relating to art, drawing or painting have emerged. If you are really passionate about any of such art then there are numerous jobs out in the market which also pay you well. Here are few jobs for drawing artists who loves to draw or paint. Drawing is applying your creativity and to imagine things not done before. It brings out various emotions in form of sketches, patterns and colours. It is also linked to right side of the brain which is to be balanced with the left side that is linked with the logical and analytical skill. Memories are built only through objects that everyone sees in their surroundings. So don’t fret if you are good in drawing and not good with academics, there are various fields to select from to get ahead in your life.